There are guardian dogs that are bred to protect other species of animals, these types of "protectors" are the ONLY exception to the rule! NEVER LEAVE A DOG AND PIG TOGETHER UNSUPERVISED. RESULTS MAY BE A MAULED OR DEAD PIG WHEN YOU LEAST EXPECT IT! Pigs and dogs typically do not mix well in a household environment. There are some pigs and dogs that do not mind each other's presence or even seem to enjoy each other's companionship. However, they should NEVER be left alone unsupervised for any length of time, no matter how well they get along or how closely they are bonded. It doesn't matter if the dog is well trained. Instincts will override training at the worst of times. If you aren't there to intervene, the consequences can be fatal. It only takes a few seconds for irreversible damage to be done, you can be standing right beside your pig or dog and they can have an altercation that changes your pig or dogs life forever. Your pigs life isn't worth taking that kind of chance. You must be careful with them being together. A lot of family dogs have accepted the pig in the home only to turn around and attack months down the road and really hurt or even kill the pig. They're defenseless against a dog and usually the pig starts the fight. They're herd animals and everyone (including the dog) is a part of the herd, so when they think they're on top of their game and challenge everyone to be the "top hog", it doesn't always turn out so well. Just please don't leave them alone, no matter what. It can and does happen even with the most docile dogs. It's just in their nature. With all that being said, I've seen dogs and pigs so very well together too and never ever have any issues, but I always like to warn those who don't know. Dogs are predators and pigs are prey. This is at the very core of their DNA. Normal pig behaviors (running away, charging, biting, challenging) and sounds (squealing, screaming) from a pig can trigger the predator instinct in an otherwise docile and friendly dog. It's not the dog's fault, they are only acting on instinct. It doesn't make the dog cruel or heartless. It is simply their place in the world as a predator. Dogs and pigs speak completely different languages resulting in confusion, frustration, stress, and aggression. Dog families are formed by packs with specific social order, respect, communication, body language. Pigs are herd animals with a different social hierarchy. Pigs are continually challenging and reassessing the order of that herd in order to keep the strongest on top, to protect and lead the herd. Usually, the pig starts the fight but the dog finishes it. Pigs have no defense against the jaws of the dog. It only takes seconds for the dog to rip the ears off the pig and maul them, often resulting in the pig's death or thousands of dollars in medical bills and permanent disfiguration. Pigs and dogs can often be friendly when they are younger, but while dogs stay fairly consistent in their temperament throughout their lives, pet pigs can go through many changes in temperament as they age. We often see a different personality emerging between 1-3 years old where the pig may no longer tolerate companionship with the dogs in the household. As pet parents, it is our job to protect our pigs and our dogs. To put their safety and welfare above our own desires of a multi species family. It's not worth the risk. Nobody thinks their family pet is capable of hurting another animal in the family, but please understand, it DOES happen. It happens far too much actually, despite all the warnings you see on every picture of a pig and dog. The truth is, pigs are jerks. By nature they are driven to challenge herd mates in order to make sure the strongest herd member is leading them and keeping them safe. The pig will continually challenge the dog as a fellow herd mate. A pigs challenge is viewed as aggression by the dog and the dog will react aggressively. This is when fights happen. The dog will quickly rip the ears off the pig and cause severe damage. Many pigs have lost their ears, their sight, their hearing, and their lives to dog attacks from the docile family dog that they were such good friends with. On the other hand if the dog is submissive enough to walk away from the pig's challenges, then the pig is confused. In pig herds they will head swipe or slam into another pig to instigate a challenge. The other pig will slam back. They will do this until a winner is declared and the loser retreats. This is the pig's cue that all is well in the world and their herd is safe with the strongest leading them. When a dog walks away from a pig, it confuses the pig. He doesn't know why the dog left. The battle has not be resolved. He doesn't know who the leader is. He doesn't know who is protecting the herd. He will continue to challenge the dog trying to elicit a "pig response" from the dog. This leads to stress for the dog and frustration for the pig as neither of them are getting the response they expect. The dog thinks if he retreats he is showing submission. The pig thinks the dog is avoiding the challenge so will try and try again, as he does not feel safe until a leader is established for the her. The continued challenges cause great stress for the dog, who thinks the pig is relentless and a bully. This is often viewed as "increasing aggression" when in reality it is simply miscommunication. The miscommunication starts off so simple but ends in heartbreaking tragedy. When a pig and dog misunderstand each other, there is no winner. There is no pig big enough to hold their own against a dog's jaws. Pigs have also been known to maim or kill small dogs and puppies during these conflicts though. It is ALWAYS better to be safe than sorry. Below is an example of how these things can start. Thankfully, this pig was not injured and there was no fight, but this could've easily turned into a tragic situation. "Dogs and pigs are a volatile combination. Unsupervised, the combination is a disaster waiting to happen." Many people are in denial and believe their dog(s) would never harm the pig, but pigs are prey and dogs are predators. Something as simple as a squeal from the pig might trigger an attack. Or a running pig might. Or perhaps the pig trying to take the dog's food or bed...or maybe just gets in the dog's space. It could be a neighborhood dog that gets over a fence, or the pig wanders into a neighbor's yard. The pig can NEVER be too safe. I have read story after story about pigs being attacked by dogs, despite the warnings from other people. It CAN happen to you, if you continue to press your luck, it WILL happen to you! Pigs are prey, dogs are predators. Pigs will usually provoke the attack, but still end up up paying the consequences in the end. These pigs were either attacked by someone's dog by accident or were used to bait dogs to train them to hunt. Some were dumped by uncaring owners and left to be attacked by roaming dogs. And if anyone thinks hunting pigs with dogs is a satisfactory way to control populations, they should study these pictures very closely and search within their damaged souls for the reason that this would be OK"
"Pigs and dogs can get along, but for the pigs sake they should NEVER be left alone together. They should always be supervised. Now why do we say this? Dogs are predators by nature and pigs are prey. If something upsets the dog, and it is the pig, it is natural for the dog to attack. And normally it is the pig that starts things, but the dog will finish it. They should NEVER be fed close to each other. If you are not going to be around, make sure you have your dog and pig separated. My male, Ziggy, who was a throwaway, almost had his face ripped off by the dog of his previous family. This happened over food. So, if you are going to have a pig(s) and a dog(s), just know that you MUST supervise them constantly. NEVER LEAVE THEM ALONE TOGETHER! Dogs and pigs should NEVER be unsupervised or left alone together. Again, it is the law of nature...dogs are predators and pigs are prey. While some dogs do well when pigs are young there comes a time when the dog has something the pig wants (like food) and pig will not back off like another dog. Then there is a problem. While some dogs tolerate the pig they also get their blood in an uproar when or if that piglet starts screaming. Even the best natured dog can lose it with a pig. Not that the pig doesn't ask for it because they won't back off but that's of no help to the pig when the dog decides he has had enough. Almost every week there are email's, news stories or posts to social media of a dog somewhere who has killed or hurt a pig. Many times it is a dog and pig that have lived together for years. But, something triggers this attack and the pig often pays the price. Those of you that have dogs, please NEVER leave them alone with the pigs. Even the most well behaved dog can blow his cool and the pig WILL pay the price. This seems to be more prominent when there is food involved or around the sleeping quarters although these times and places are most definitely not the only situations. However, we KNOW these times can be volatile. Then there are dogs that will run a fence with the pigs on the other side and literally run the piglets to death. That pig scream is an open invitation to a dog. There are people that have lucked out but the luck may not be everyone's and again its not worth the risk. Anytime you put two species together with one being predator and one being prey you can have problems." "Can I keep my pig with my dogs or other animals?" Not in most cases. Dogs will naturally attack and kill pigs. That is the normal predator (dog)/prey (pig) relationship. It doesn't matter how well they seem to get along. What may appear to be "play" between a piglet and a dog at first, is a prelude to the eventual deadly encounter. In time the dog will naturally attack the pig. A small toy breed dog will not be likley to offer much aggression but any hunting dog or large breed is extremely high risk. Please go to www.pigpals.com and click on the educational links page for more information regarding that subject. Most have ears, noses, feet and rectums chewed off when its a dog attack"
"PLEASE DO NOT BASH THE PIGGY MOMMY AS HER HEART IS BROKEN! THIS POST IS TO WARN PEOPLE AND EDUCATE ON PIGGY AND DOGGY DISASTERS ONLY! I hate that I am having to write this. We tell everyone in advance that if they have a dog and choose a pet piggy, to be VERY careful with the two and to never leave piggy and doggy alone together. We warn that dogs are a predator and pigs are a prey animal. But we never go much into detail and that is now changing. There are lots of cute videos and photos of dogs and pet pigs cuddling and playing and that is ok….humans are there to video and can protect the piggy. But leaving them unattended is NEVER ok. We had a very good piggy mommy lose her precious baby yesterday because their family dog wanted to play with piggy. Dog is small, very sweet, very loving, "wouldn’t hurt a fly" and not at all aggressive. Piggy had laid on the sofa with the family and dog several times and there was no indication of any threat. Yesterday, piggy was safely in his pen (it was an open top) and dog was in the home. This has been working fine with humans at home and dog had shown no interest in getting in with piggy or that she even remotely cared that piggy was in the home. Their human needed to run to the store and was gone less than 30 minutes. When she returned home....Dog had jumped in piggy’s pen, things were all array, and dog had taken piggy out of his pen, she found him in the floor. She rushed piggy to the vet (which is only minutes from her home) and he was already gone. I spoke with the vet personally. He said there were several puncture wounds all over piggy’s body, ribs and bones were broken and crushed from what he could feel. He said the dog used piggy as “a chew toy” a “rag doll” of sorts . Everyone wants to think their dog is the “exception” and I want to tell everyone…. that is NEVER the case. There is no exception to this rule….it is the way dogs are created…they are a predator. You may have let your dog be alone with your piggy and things went fine, but then there can be that one moment when instinct takes over and it won't be fine. The vet said, "NO MATTER HOW GOOD THE DOG IS….IT IS THEIR INSTINCT TO BE A PREDATOR AND PIGS ARE PREY.” So please, please, please NEVER leave your piggy alone with your dog….no matter how small or sweet your dog is….the piggy has no chance up against a dog "
" "It is unbelievable how the "not my dog" belief can be put above a pigs life. It can happen. It does happen. This dog is a sweet, loving, never aggressive, perfectly behaved dog. And it happened. It didn;t happen the first time they were left alone in the house....but it did happen and he is dead now. But size is really not an issue. I have read about a chihuahua chewing off a piggies ear today. And about a yorkie chewing off an adult pigs ear as well. We can't blame the dog, it is the way they were created. They are predators by nature." " Its a lot of work for me to keep my animals separated at all times. The breed of dog you have does not matter- ANY dog no matter how perfect is still a predator. There's a pig Mom on here whose yorkies (tiny little doggies!) bit her pigs ears off. My little terrier is only 20 pounds an b-hole to anything and everyone. My pit is named Squishy because she just wants to lay on and cuddle everyone… but the same rules apply to them both." "I have seven dogs and two pigs. The "kids" are allowed loose in the house when supervised together and do okay, and we've had a couple of oops moments when everyone has ended up outside together and done fine, but I simply will not chance doing it on purpose. My oldest pig is somewhat aggressive towards dogs, and I'm not going to risk him starting something he can't finish. As a rule we rotate play yard and house turns, and occasionally some of them have "quiet time" in their crates for a bit if needed. We're working on fencing a second play yard just for the boys so everyone can be out at once. If you are set up in a situation where you are able to rotate dog and piggy so you have time with both without either being miserable, then by all means try to make that work. If not, it's not fair to your dog or your pig or YOU to put everyone through that stress. As for bully's, I agree that they have a fairly high prey drive, but I've also noticed that Malcolm is the one of our dogs who has tried to figure out how to "speak pig" and play with the boys, which speaks strongly to their good hearts." "Saw first hand yesterday while at the vet; a prime example of a pig dog horror story. The dog grew up with the pig the lady explained. She said the altercation was over a toy. The dog wanted it and her pig was sleeping with it. The pig had holes all over it's body. It was missing parts of it's ears. It's snout was partially gone. She said that when she adopted the pig and the dog and they were only a few days apart in age (6ish weeks) They're current is 7 months." "A dog is a dog not a child. Nature versus nurture does not count in the animal kingdom. I trust my smaller animals only with my livestock guardian dog and even that is not absolute. My very sweet, docile, well trained, raised with the pig, yada,yada,yada snapped and bit my pig. It was all my fault for forgetting the nature of the dog." "A dog vs pig story; Pea was with me pretty much all day yesterday since my daughter had school and work. She was her usual troublesome self, open the snack draw a hundred times, move the garbage can, shred something, charge the MinPin, try to eat sequins off my flipflop....etc etc then she would just "snuggle" behind me on couch. Last night I was in kitchen with my daughter and Pea. Pea was wanting some of my pudding (which is another whole story-just trust me when I tell you never use almond milk) and our big Dobe came in and was standing next to her. Happens often without major issues. I was inches from Pea and Jake maybe a foot plus away from us. All of a sudden he lunged at her and was biting her face. She was freaking out, I screamed at Jake and he stopped. Thank god he stops when I tell him to, I just wish he would warm up to her but thats never going to happen. So Pea was bleeding and trembling and sort of whimpering but over all, she is ok. From what I could tell she has a gash/scrape on the side of her snout/lip area and thats it. We cleaned her up and calmed her down and she seemed ok. My point is, I was RIGHT THERE, so was my daughter and something snapped in my dogs head to make him go after her anyway." I think people have trouble grasping the concept because they can't separate their companion's sweet personality from a dog's natural instinctive response to prey. I would get very angry at my dog but the truth is that it's so natural for them to react this way. People could end up never having an issue.. But if one day they do? Is it worth it? I'd rather separate and be safe"
What about guardian dogs? These dogs have been bred to protect livestock and other species of animals. They are the ONLY exception to the general rule of not leaving pigs and dogs alone unsupervised. These dogs have a proven record of safeguarding our porcine friends and a duty to protect them. We all know the dangers of pigs and dogs. And for the most part, i believe pig owners do their part to avoid any injury to their pigs by the family dog. Twice this week I have heard of a pig being attacked by a stray dog. In one of the cases, I'm not sure of the circumstances, but the other? I know what happened. 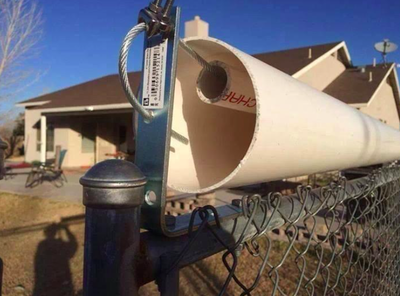 One of my good friends recently purchased a house in the south and her pigs are protected by a fence, so she thought. A stray dog climbed her fence and attacked one of her pigs. The dog had been around before, but had a good disposition and obviously wasn't a threat because her pigs were safely tucked behind a fence. Please don't forget a determined dog will do whatever they can to get what they want. A pig can't climb the fence to get away, but another animal can most definitely get to your pig behind a standard size chain link fence. Please please please check for any breaks in your fencing, make sure your gates are locked and try your best to ensure your pigs are safe at all times. This was an unfortunate event, her pig will be fine, she survived, but does have multiple injuries and is battling an infection right now. My friend wasn't home at the time, but her husband was and once he saw what had happened, called her and she raced home from another state to be with her pig and assess the situation. Infection can set in fairly quickly and its difficult to truly clean the wounds like your vet would do. This particular pig had to be sedated and the wounds were tended to under anesthesia. There are things you can do to try and avoid these kinds of incidents. First, do NOT engage with a stray dog, shoo them away, call animal control, whatever you have to do, but don't let them think they're welcome at your home. Second, add something to the top of your fence that will help keep your pig(s) secure behind your fencing. 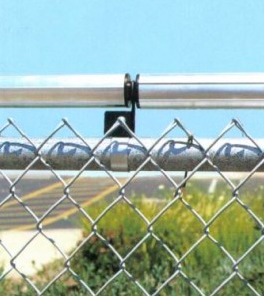 Some chose to place electric fencing up around their usual fence, other choose a privacy fence or flat surface fencing that a dog isn't able to climb. 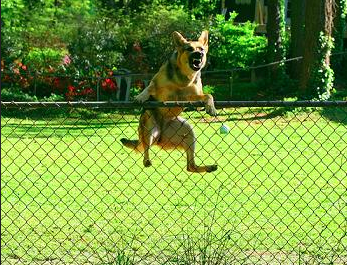 I googled dogs climbing fences and screen shotted a pic to post here, but there were so many to choose from, its apparently a problem some dog owners have. 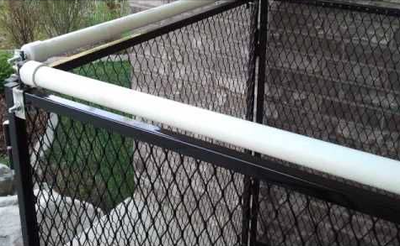 So I also screen shotted a couple of examples of things you can do to prevent or at least lessen the chances of this happening to your pig, DIY ways to fix your fencing so no other critters considered dangerous to your pig can get in. As we all know, it only takes a few seconds for irreversible damage or death when it comes to a dog versus a pig. These solutions may not look the prettiest, and I am sure there are better solutions, but with most people being on a budget, I figured the most helpful solutions would be something you could do yourself without having to replace all of your fencing. Nothing is fool proof though, always know whats hanging around your area and try your best to keep the situation under control. Story copied and pasted from Portugal APL website. You can click here to read it in on their website. Meet Atlas, a pot-bellied pig that is lucky to be alive. 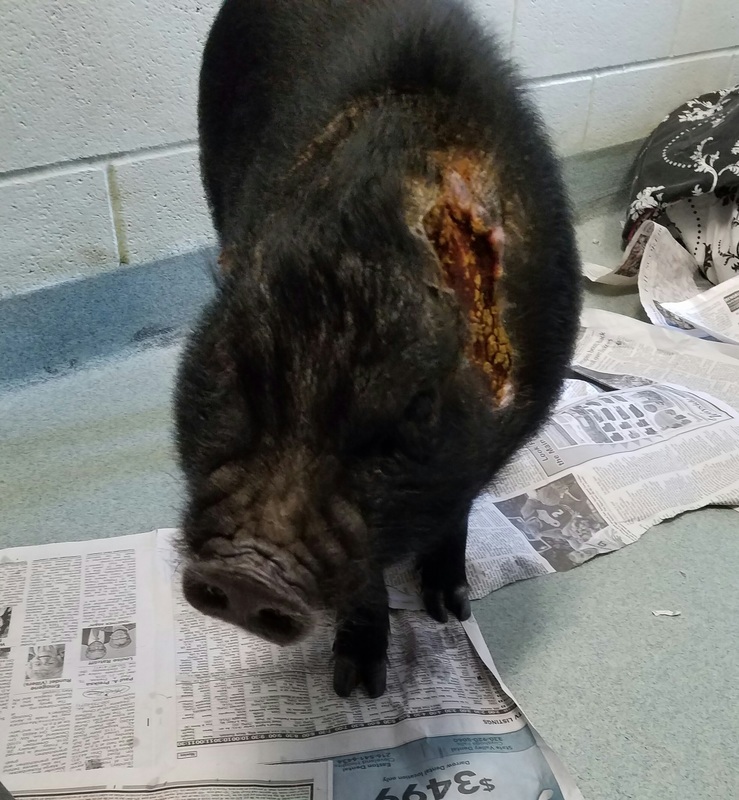 Last Tuesday our Humane Officer Rachael received a call about a pet pig that had been attacked by the resident dogs and had been suffering for some time with no medical care. Dr.Trish from Red Star Veterinary Clinic came out to examine him as soon as she could get here. After sedation, some major wound cleaning, removing of dead flesh and medicine, she thought this tough little guy could make it. Sadly, his ears and ear canals had been chewed out as had much of the flesh on his head. We can’t imagine the pain he endured. This little guy is now permanently deaf. So far he sees fine and wags his tail when we come to give him salad. Each day he tolerates wound cleaning and medicine from the staff but still seems to have a positive attitude. We have named him Atlas for his strength and endurance. We reallyhope he makes it. After all he’s been through, we’d love to find him a happy home. Until then, we’ll keep you updated. He has a long road ahead. This is a story that was posted 04/06/2016. Don't be "that person" who puts their pig in immediate danger by leaving your pig with your dog. Do not promote dogs and pigs get along fine, the truth is...There will ALWAYS be a risk. There may come a time when a pig pushes the limits and the dog acts in a natural way and bites. Your pig will pay the price for your lack of judgement. Pigs and dogs are NOT ok to leave together, even if you are right there an attack can happen. Do not be the person posting and asking for help when your dog attacks your pig because you failed to listen.